Today we are interviewing Joseph V Cassarino, author of A Simple Guide to Start Overcoming Divorce Pain. I am a retired businessman and father of three. I live a healthy lifestyle . I pay attention to proper nutrition, I spend time in nature every day and I am self aware of my thoughts, words and actions and how they effect others. I strive to learn, grow and evolve daily and I realize my should connects me to the divine which gives me the wisdom to have understanding and compassion towards others and not focus entirely on myself or the needs of my ego. There is only one purpose for my eBook and that is to inform others how to utilize holistic methods to transcend their emotional pain. Emotional pain is a mindset. After a person becomes clear, centered and balanced, they will realize, there is no problem and the divorce was merely an impetus for their soul's evolution. This is what my eBook helps others realize. Your own personal experience with divorce motivated you to write this book. Can you tell us a bit about how it inspired you? I was devastated and heartbroken and I knew I had a choice to either fall apart and spiral downward or to rise up and tap into my inner strength, my spiritual source which resides inside me. I studied extensively on subjects of science, religion, psychology and at the end of the day, I discovered, humans attach to their ego's which is not what we are. Quantum physics now proves, we are noting except energy and consciousness. This being said, I tap into my consciousness and raise my consciousness and transcend my emotional pain. Anyone can do it and that is why I write about it. In your book, you emphasize a holistic approach to healing heartache pain. Why is this the best approach? The best approach to holistic healing is combining nutrition, gratitude, nature and self awareness or what some call meditation. People in emotional pain, need to focus on the ROOT cause of their emotional pain, not mask it with prescribed medicine, drugs, alcohol, or other stimulants. You started out writing articles about heartache for magazines before beginning writing eBooks. What made you decide to write eBooks? Every editor and publisher published my articles on the spot and praised my writing ability. I received 1000 Facebook Likes in one day on my first article alone. 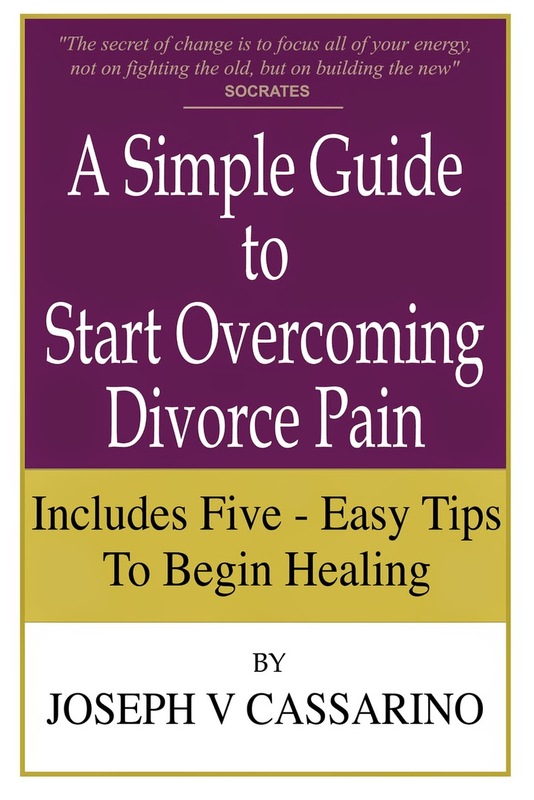 Therefore, after I discovered I have a gift, I decided to write a series of eBooks devoted on the topic of how to divorce pain; which took me a year to complete and I built a website to self publish my eBooks. Who do you think would most benefit from reading this book? Any divorced person being the wounds lie deep and most people are not aware how to dig deep through introspection and self awareness. Most people do not understand they have to alien themselves in an all natural and holistic approaches to. Love inspired me. I love every soul; being I fully understand we are all connected and that we are in essence, collective consciousness. This is what the universe is made out of, energy and love. To that end, I love everybody and everything. Quantum physics now proves, even the rocks we view as solid; are nothing except, moving, living energy. Everything in the universe consist of energy, light and love. Once you understand this, it is easy to transcend emotional pain. What was the most interesting thing you uncovered while doing research for the book? That we have an inner source, a God Source, a hidden power inside ourself which scientist now claim; is collective consciousness and we can tap into our higher self, being we are a microcosm, we are the universe living inside our own reality. I know for certain my eBook will change the readers perspective from that of looking outward to looking inward. I know my eBook will inform the reader how to utilize all natural, holistic methods to eradicate his or her emotional pain. I recently completed a simple to follow 4 Week eCourse for $29 which also provides amazing, life changing methods to transcend emotional pain. The information my eBook offers is truly priceless. The content is ripe with positive, inspiring advice, advice certain to help anyone overcome their heartache.